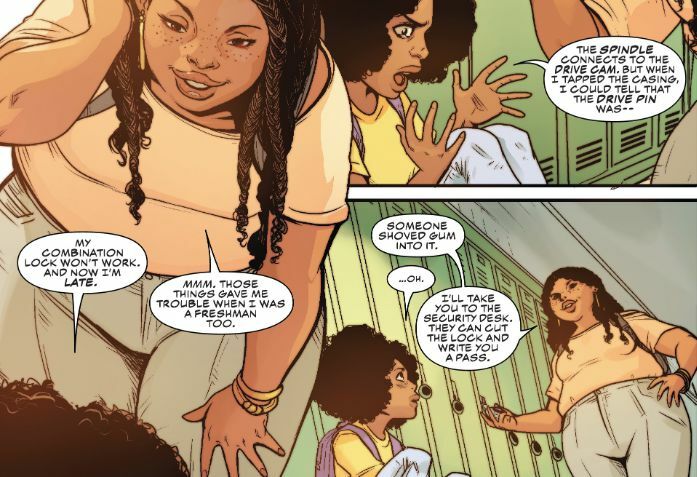 The second issue of Ironheart proves why it's such an important comic. Ironheart is basically a spin-off of Iron Man. It follows Riri Williams, a young black woman and genius engineer who builds her own suit of armor after spending the last year looking for Tony Stark. You could easily write her off as a female knock-off of Tony Stark. The great thing is Eve L. Ewing knows what you might be thinking and plays it off perfectly. 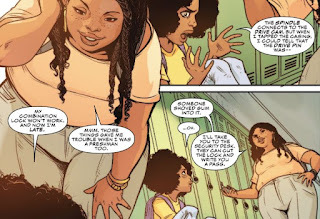 The story picks up a flashback of her first day in college prep high school as a young girl. She struggles with her locker while the older kids make fun of her. That is until a woman named Daija Hamilton points out the lock had been sabotaged by gum and takes her to get the lock cut off. This simple moment of friendship tells you everything about the kindness of her new friend and how women need to stick together. Flashforward five years and Riri is stopping a gang from extorting protection money when the crooks start shooting at her. Ironheart takes them out but the storekeeper gets her name confused as "Little Iron". 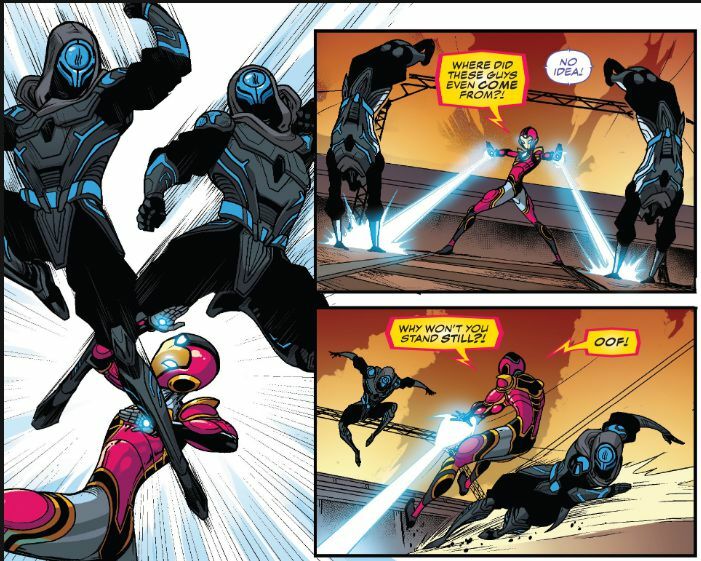 Ewing makes this joke several times ("Iron Chick") as she plays off people's expectation that she's a sidekick of Iron Man instead of a full hero. Ewing is able to perfectly reflect the struggles black women face as well as humanizing her in other ways. Riri gets paralyzed by PTSD because of the death of her family. She has to fight against the University Dean's attempts to monetize her work by letting Alchemax examine it. Riri goes home after hearing her friend Deija is missing and notices that it's not in the news. An all too common occurrence these days. It turns out Daiji is working for councilman Birch who's running for governor and he'd been plagued by a cell phone hack. She heads for Daley Plaza and chases down a cell phone thief only to discover it's a 9-year old boy. Just when he tosses her the phone saying "they're gonna be so mad" she gets jumped by two techno ninjas who seem to know her armor too well. Her A.I., NATALIE, reminds her to think "what would Riri do". She blasts them while they talk about the "Wellspring of Power" and "the circle exceeds us" before teleporting away. The truth about who the kids are and the connection to her missing friend is shocking. Ewing's writing is sharp and poignant and her dialogue is modern without being stereotypical or dated "I almost got got"). The artwork in Ironheart is amazing and the rich colors pop off the page. 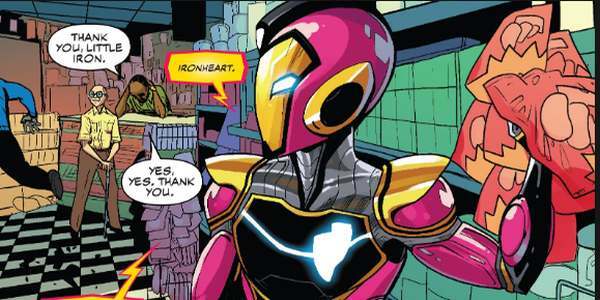 Besides the bright pink of Ironheart's armor, there are vibrant colors throughout the book thanks to Matt Milla. Luciano Vecchio does an amazing job with the faces which have a wide variety of shapes and colors that show the range of ethnicity. Geoffo has some brilliant layouts that seem to literally break off the page. 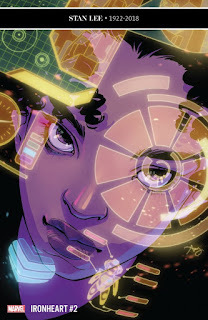 Ironheart #2 is wonderful and worth picking up to follow the latest superhero in the Marvel universe as she explores the smaller crimes in the Marvel comic universe. Black girl magic indeed. What do you think of Ironheart #2? Let us know in the comments below!